The IO-Link compatible sensor range from Omron currently incorporates through beam, retro-reflective and diffuse reflective photosensors, colour mark sensors, standard proximity sensors and spatter-resistant proximity sensors. Features offered by the sensors include the ability to monitor and report their own performance and support on-the-fly reconfiguration using data transferred by the automation system. The sensors are complemented by two IO-Link master modules, one with screwless clamp terminals for use with pre-wired sensors, the other with Smartclick connectors. 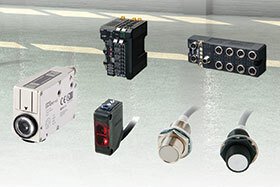 Both master modules allow the connection of standard sensors, as well as the IO-Link types, making it easy to upgrade existing machines and systems. Omron’s IO-Link products are part of the company’s total automation platform, which also includes support for EtherCAT and EtherNet/IP. For seamless integration, IO-Link products are included in Omron’s Sysmac Studio software environment, which provides comprehensive facilities for configuring, programming, simulating and monitoring automation systems.